Ranging in size from a few containers placed in a sunny spot to several acres, butterfly gardens can be grown throughout the United States. Throughout the country, the general requirements for butterfly gardening are the same: full sun, nectar source plants, larval host plants, a pesticide-free environment and knowledge of the local butterfly fauna. Nectar-producing plants will attract butterflies to your garden. Many nectar-producing plants are native species which require little attention, as they are naturally adapted to the region in which they live. One of the most common mistakes in butterfly gardening is planting only one nectar source. Adult butterflies have a very short lifespan. Planting a variety of nectar sources will encourage more butterflies to visit the garden. But, in order to support a full butterfly life cycle, host plants (for laying eggs and use as a caterpillar food source) must also be present. Planting an adequate supply of host plants gives butterflies a place to lay their eggs, which will successfully hatch and result in butterflies that will continue to visit the garden. Butterflies typically lay their eggs in late spring, and the eggs hatch 3–6 days after they are laid. It takes 3–4 weeks for a caterpillar to pupate and 9–14 days to emerge as an adult. Butterfly gardens are best planted in the spring with younger plants or in the fall with mature plants that will become dormant quickly and re-emerge in the spring. It is best not to plant in the heat of summer or the cold of winter. Good resources for learning more about butterfly gardening include zoos, botanical gardens, butterfly houses, garden centers and nurseries, libraries and the internet. There are many good websites dedicated to butterflies and butterfly gardening. 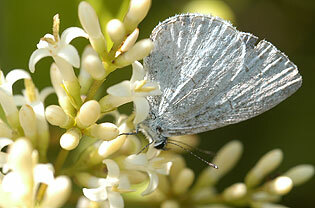 Plants, especially flowering plants, need sun to make food for themselves and nectar for butterflies. Butterflies also need sun to warm their bodies for flight. Butterflies are attracted to flowers with strong scents and bright colors where they drink sweet, energy-rich nectar. 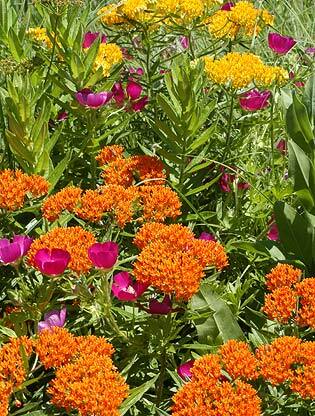 Select plants that are native to your area and they will attract local butterflies. Butterflies lay their eggs on host plants that the emerging caterpillars will eat. The sight of a butterfly emerging from a chrysalis will more than make up for the chewed leaves. Butterflies see more colors than humans do. They seem to prefer red, orange, yellow, purple and dark pink. A large, colorful garden is easy for butterflies to find and encourages them to stay longer. wash pests away with insecticidal soap. Each butterfly has a favorite nectar plant and needs a specific host plant where it will lay eggs. Learn about local butterflies, so you can provide the right match of plants to make your garden a popular hangout. You've set the stage; now watch the show. You won't be disappointed.